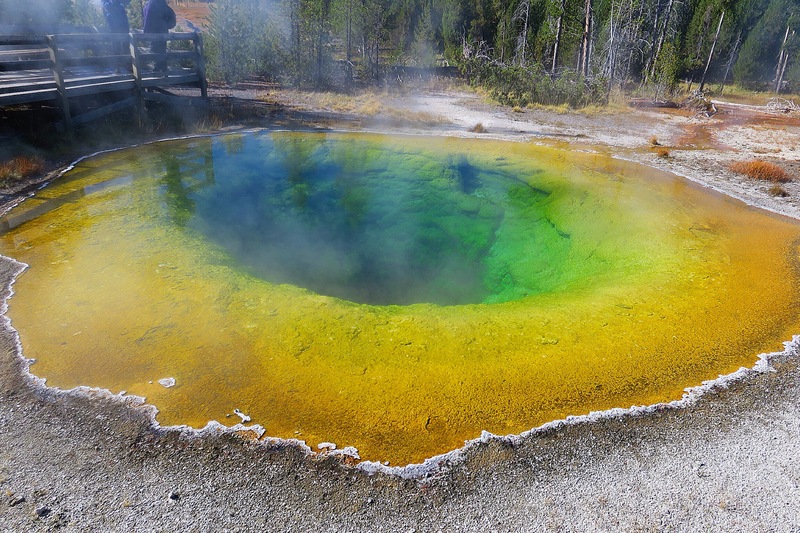 YELLOWSTONE PART ONE: LIVING RAINBOWS OR KALEIDOSCOPE EYES? 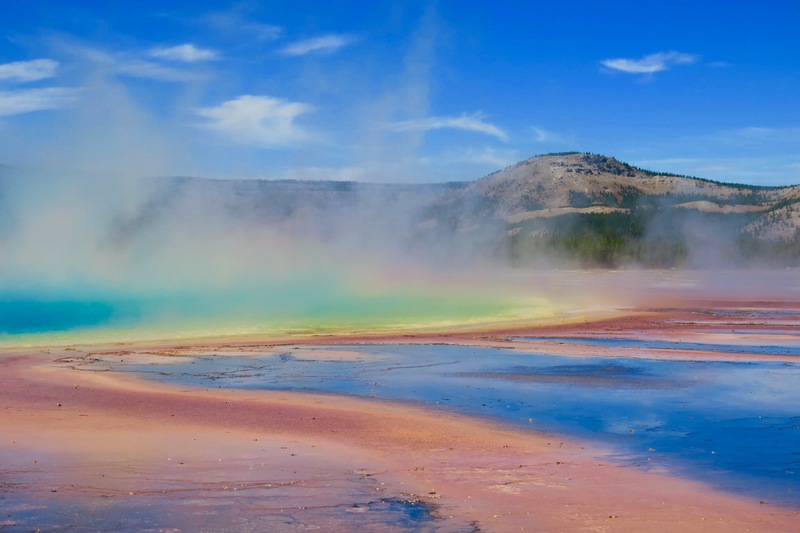 Not to blaspheme, but one of the most wondrous thing(s) I witnessed during my visit to Yellowstone National Park was not Old Faithful. 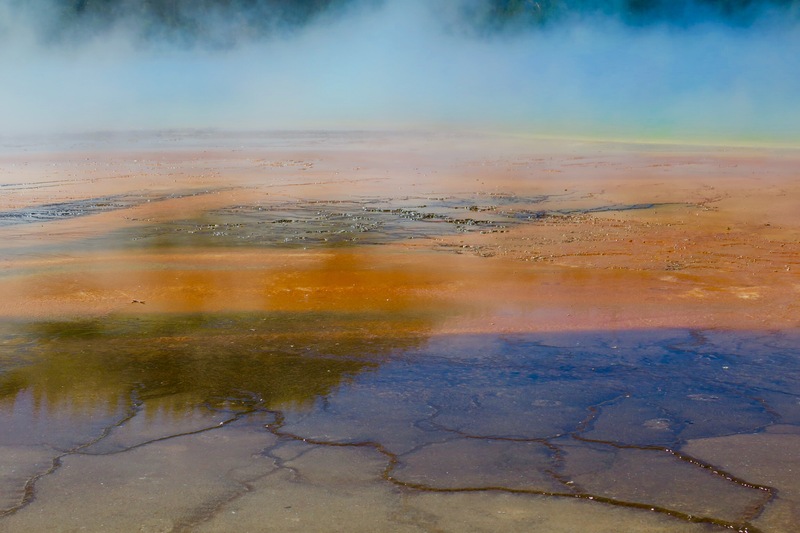 Don’t get me wrong – it, as well as other geysers that are in the various basins of Yellowstone are marvelous, setting a tone in the park that is quite primordial, with their steam rising and blanketing the area in foggy mist – and they will get a well deserved post later on.. 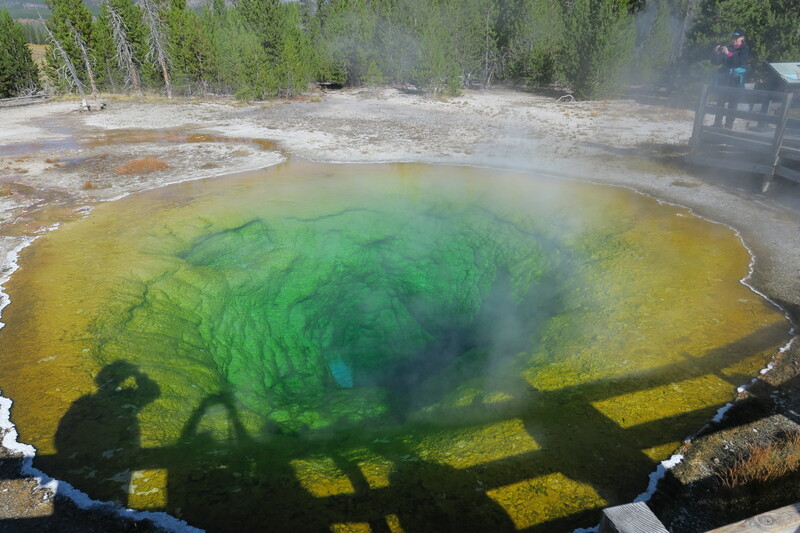 However, I was totally astonished by another group of geothermal structures – the hot springs. But first, a little geophysical history. 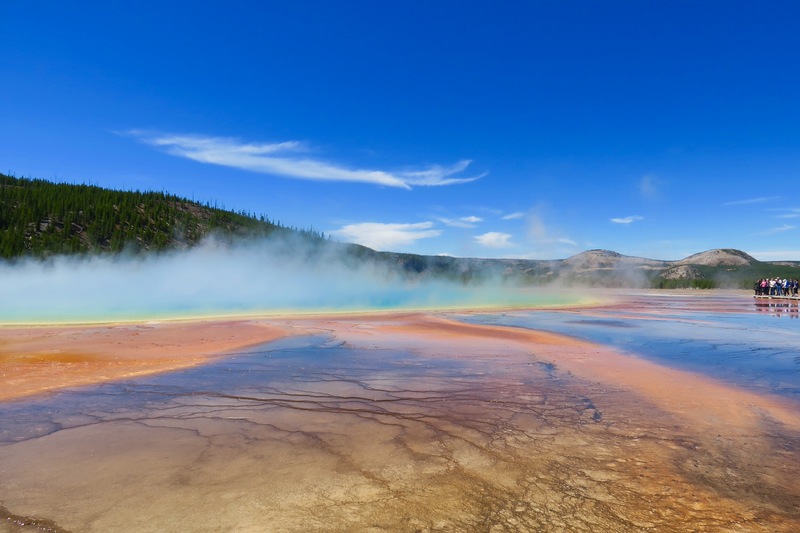 How did Yellowstone become the center of so much thermal activity? The Earth is made of three layers: the core at the center, surrounded by the mantle, and then the crust. 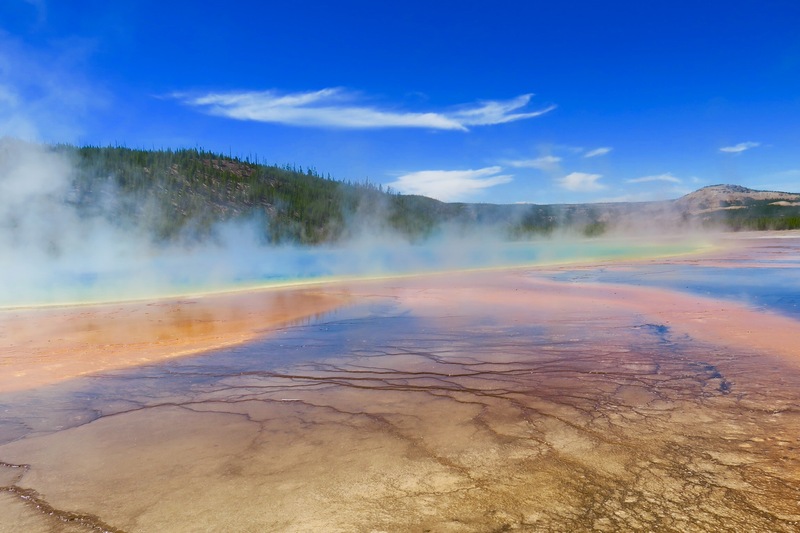 Millions of years ago, a source of immense heat known as a hotspot formed in the Earth’s mantle below what today is Yellowstone. 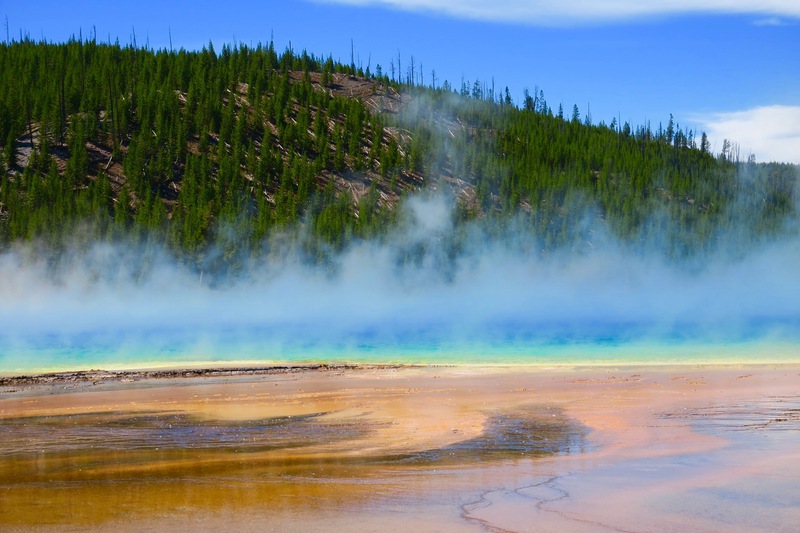 Roughly 600,000 years ago, the hotspot pushed a large mass of magma (hot, liquid rock) toward the Earth’s surface. 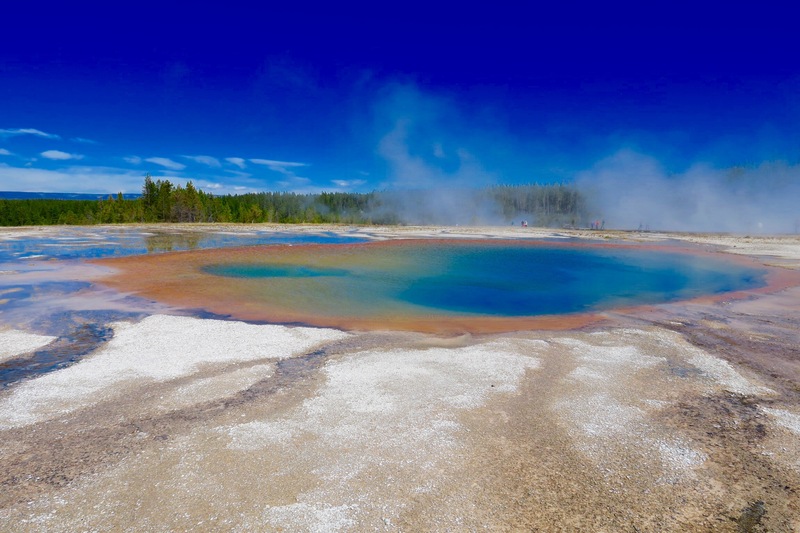 This pressure eventually caused a cataclysmic explosion and then the land collapsed, creating the Yellowstone caldera (volcanic crater). 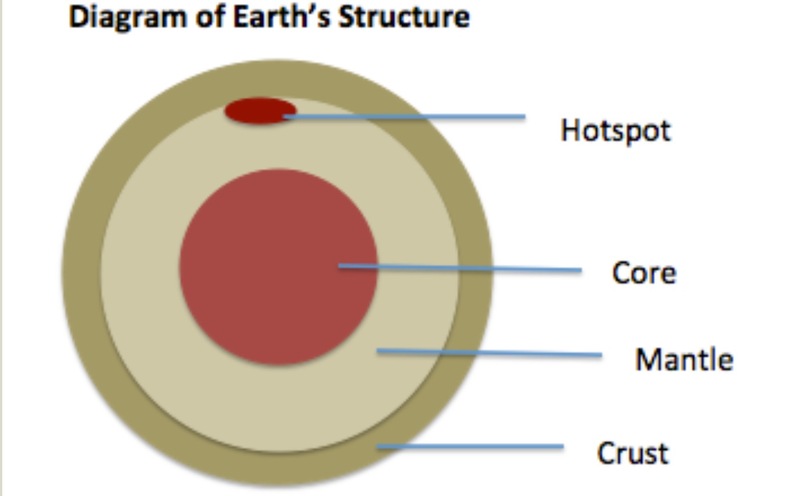 The Earth’s crust and upper mantle is also divided into many plates, which are in constant motion. Where plate edges meet, one plate may slide past another, one plate may be driven beneath another or rise together. Plates may also be pushed apart by rising volcanic material. 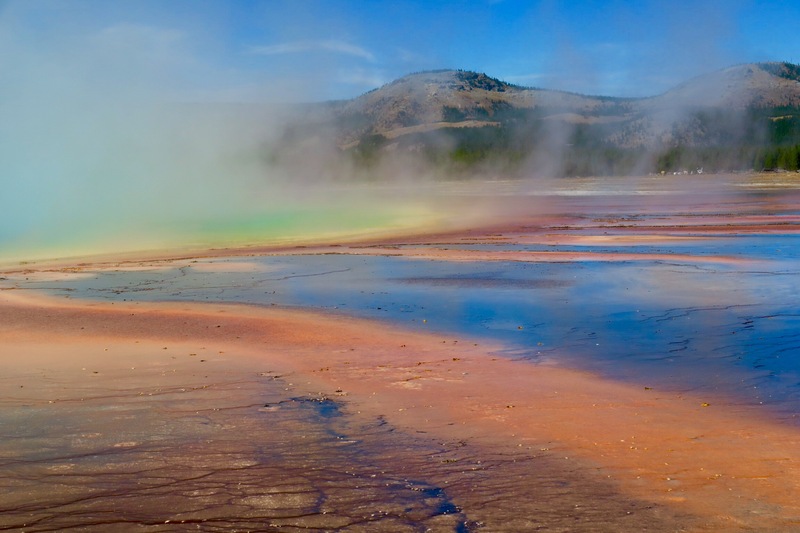 This combination of plate movement and molten rock uprising is what has shaped Yellowstone. 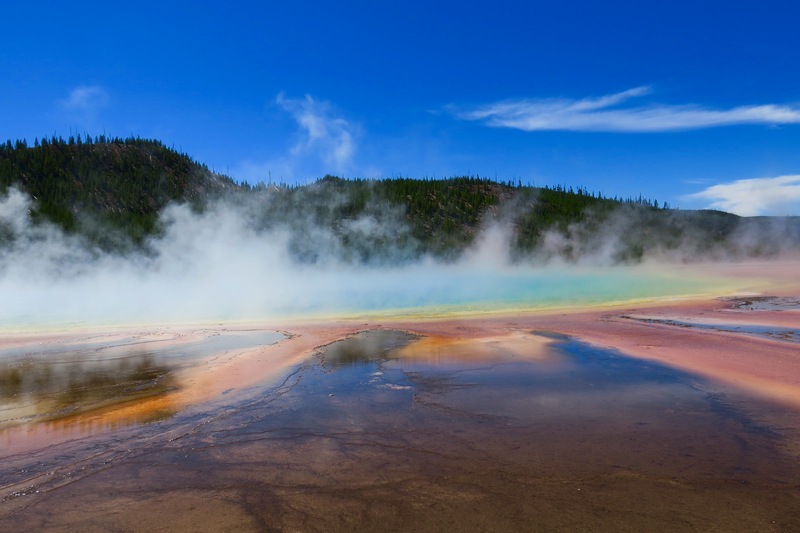 In addition, there are still some of the earth’s most active volcanic, hydrothermal and earthquake systems below Yellowstone including a large super volcano with magma so large that it’s eruption would be catastrophic – have you seen 2012? No worries, it is not expected to burst for a few thousand years. 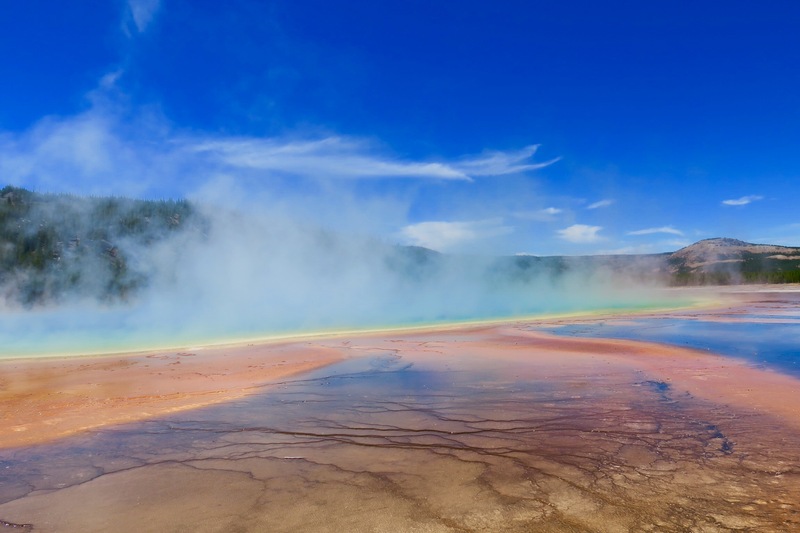 In addition to this super volcano there are steam vents, geysers, mudpots and today’s subject, hot springs and basins, some of which are highly corrosive and toxic. 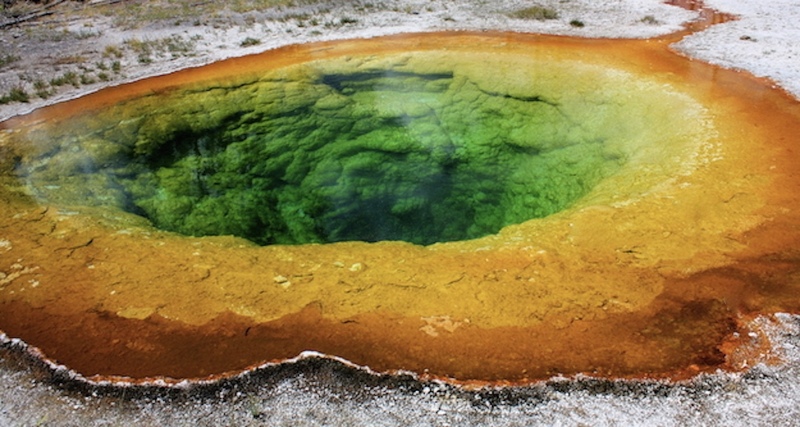 How does a hot spring work? 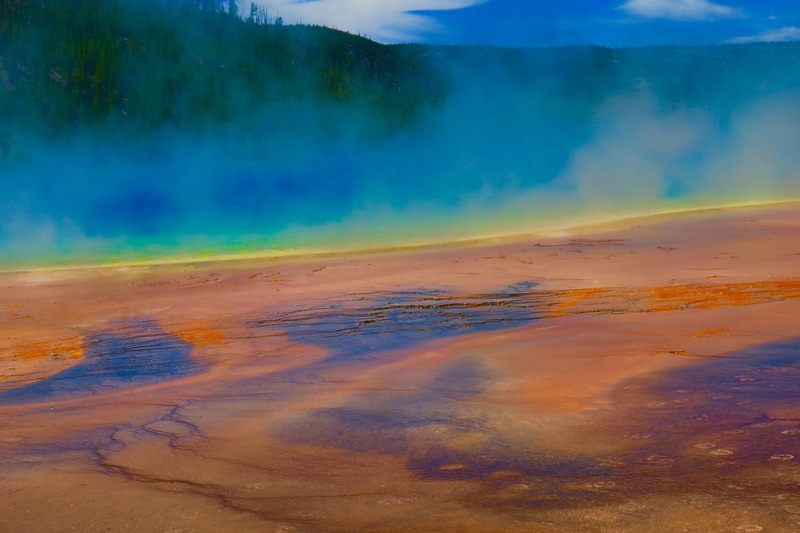 As you can see, the steam from these pools often makes it difficult to see the colors. 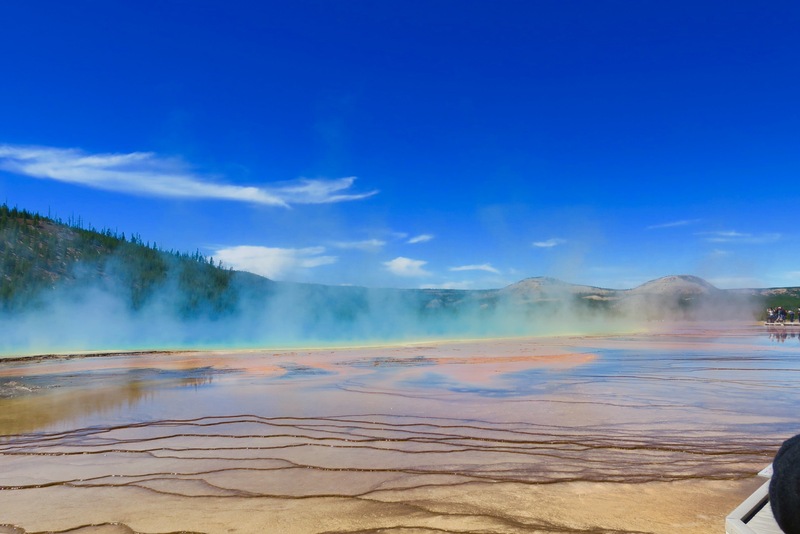 And, as many of the pools had steam rising and blowing – walking through the basins was like going through a very hot steam room – if not for the sulphurous smell often accompanying the steam, it would have been a pretty effective hydrating facial. 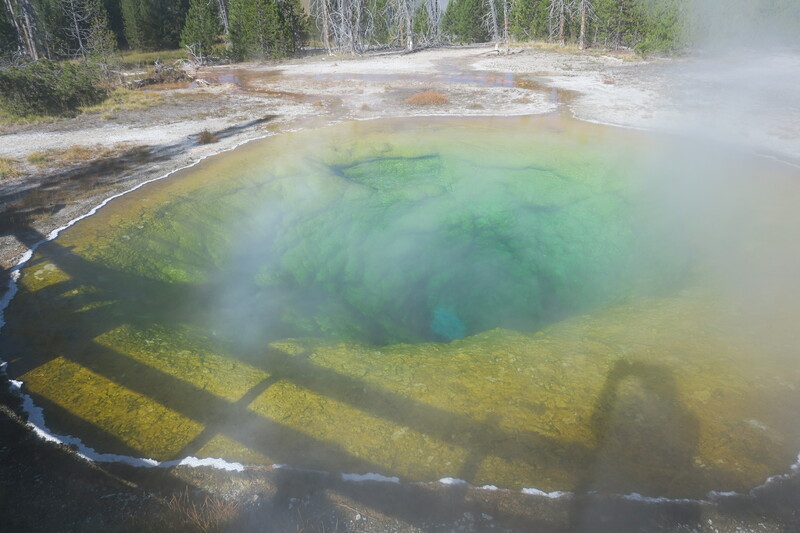 EMERALD POOL – Temperature 154.6°F Dimensions 27×38 feet. Depth 25 feet. 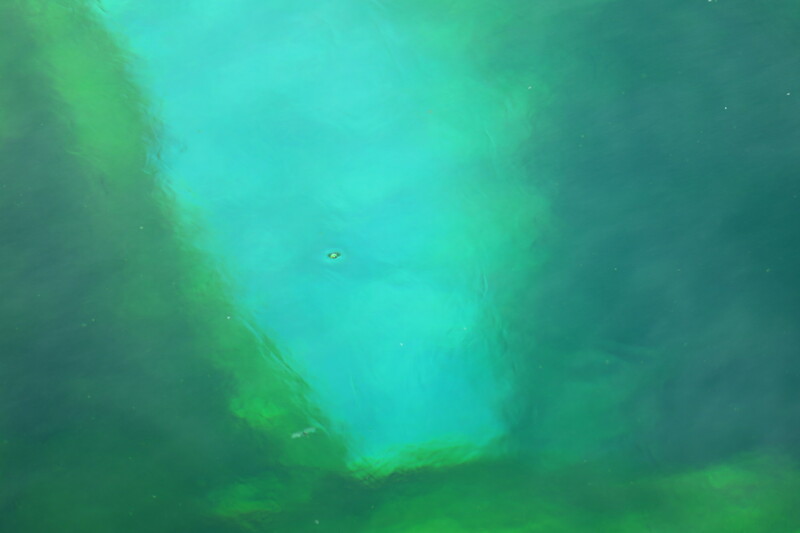 The not super-hot water attracts yellow bacteria (and algae) and the clear water, as is the case with other bodies of water, reflects the blue color of the spectrum while absorbing the others. If you remember your basic color rules, yellow+blue = green. 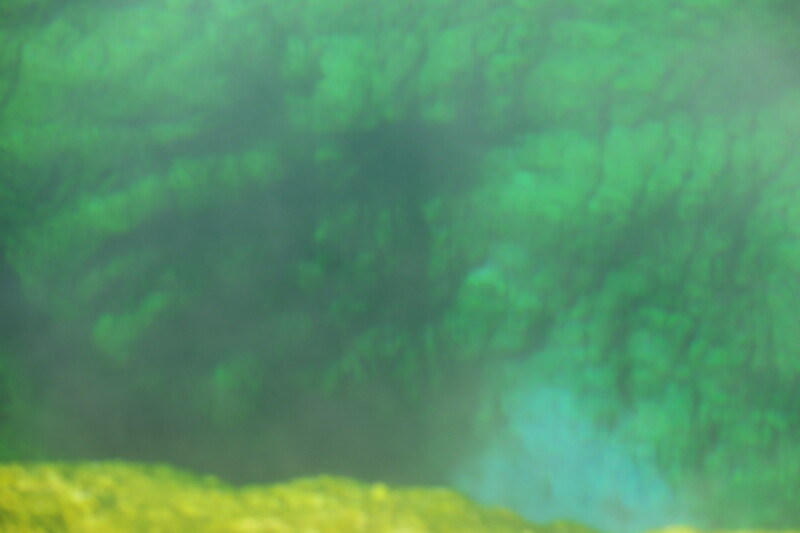 Unfortunately vandals have thrown debris into the water upsetting the natural process, lowering the water temperature and changing the bacteria that grow on the outside edges adding the colors orange and brown. 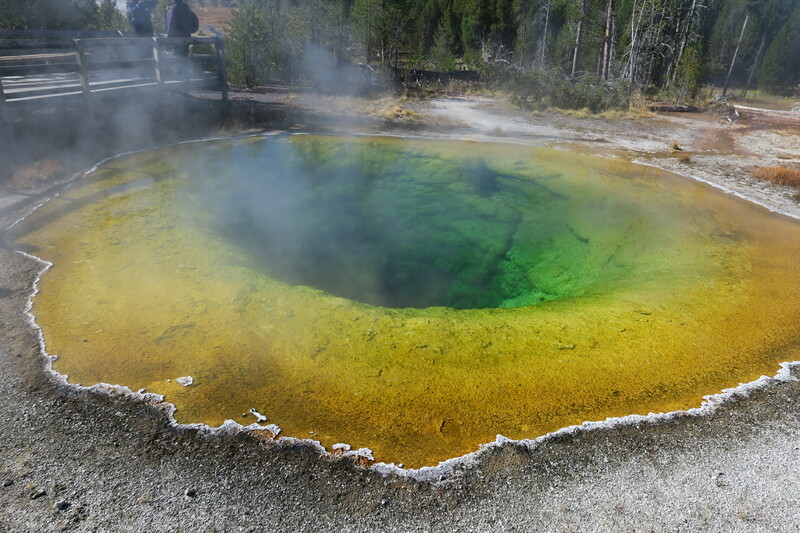 MORNING GLORY POOL – Temperature 171.6°F Dimensions 23×26.6 feet. Depth 23 feet. 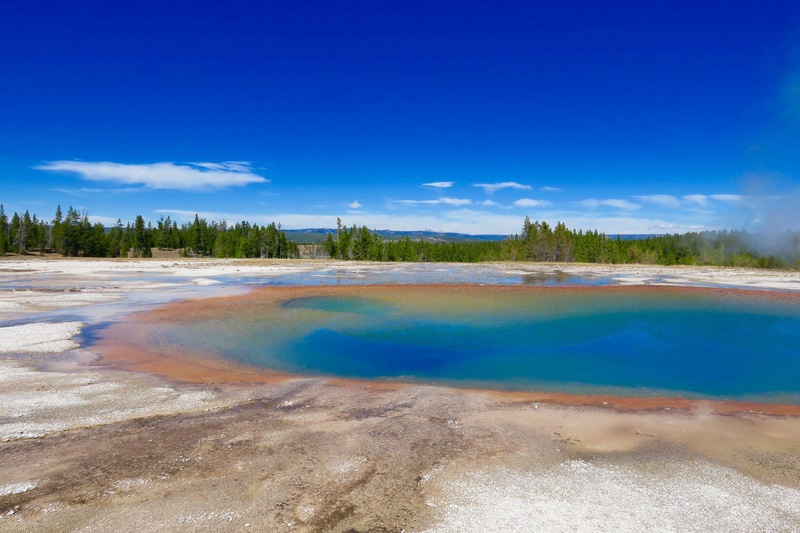 This is another magnificent hot springs pool that has been effected by the careless droppings of such trash as socks, coins, towels, handkerchiefs, the still beautiful Morning Glory Pool. Not only was debris thrown in but water was actually siphoned off at one point, causing the pool to erupt. 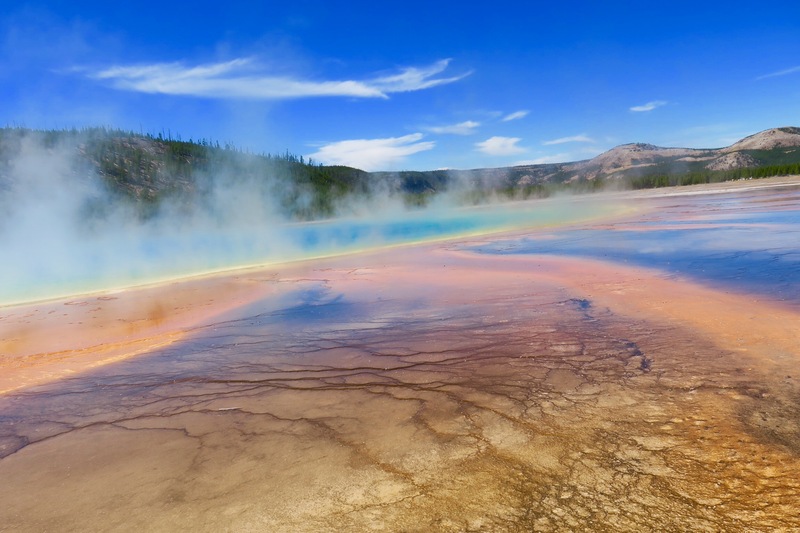 It is a shame that such spectacular natural phenomena has been subject to such negligence – hopefully new restrictions will save it from further abuse. Are you ready for the almost unbelievable? 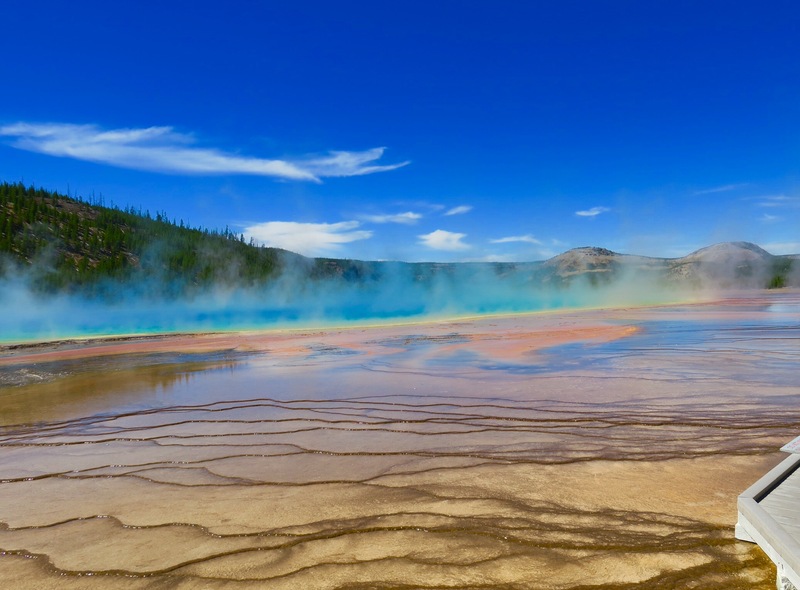 GRAND PRISMATIC SPRING – Temperature 147-189°F Dimensions 250×380 feet. 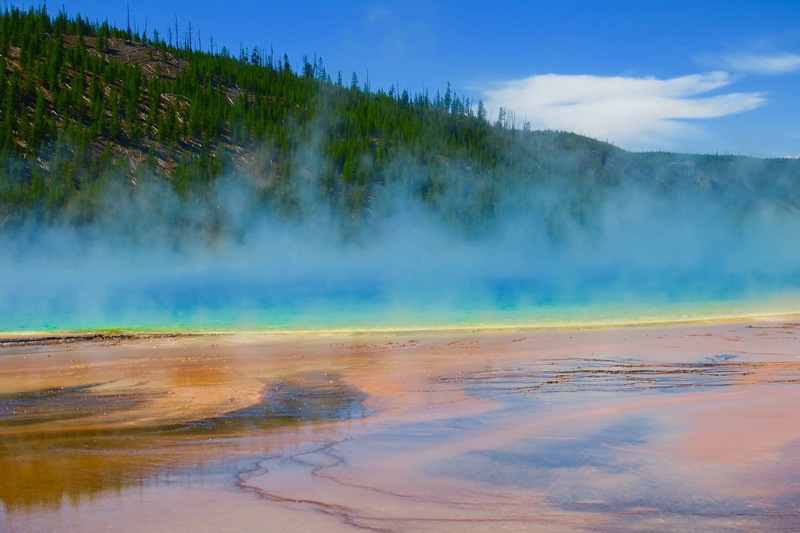 Grand Prismatic is the largest hot spring in Yellowstone, and is one of the largest in the world. 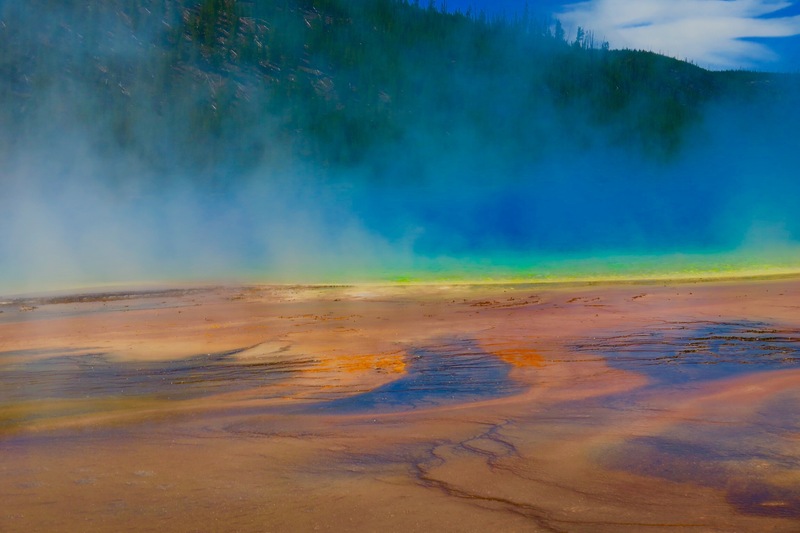 The colors range from deep blue, green, yellow, orange to red. 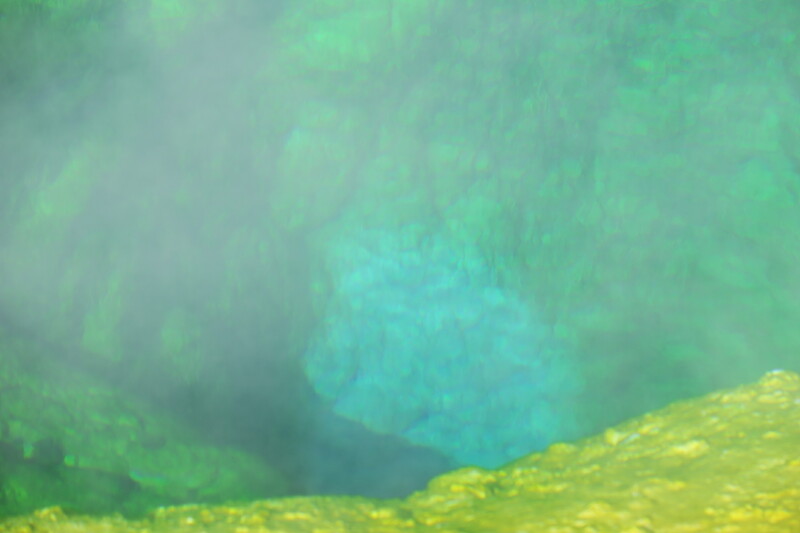 This hot spring is in a vast open area beset with wind gusts that have blown many a hat into the Do-Not-Enter area. This is not just an idle threat – the ground and waters are so hot and toxic that those who have ventured beyond the proscribed route have met with scalding and even death. 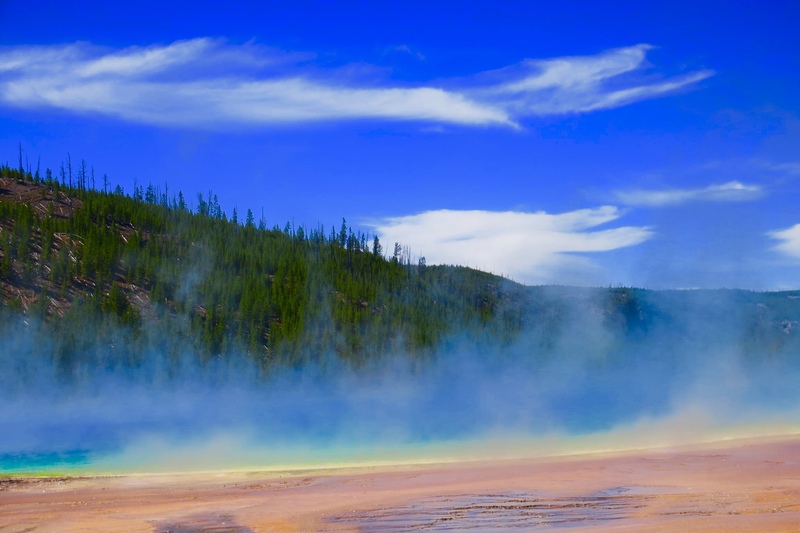 The wind gusts sometime cause the steam to cover the spring – but the result is often breathtaking as the steam takes on the colors. 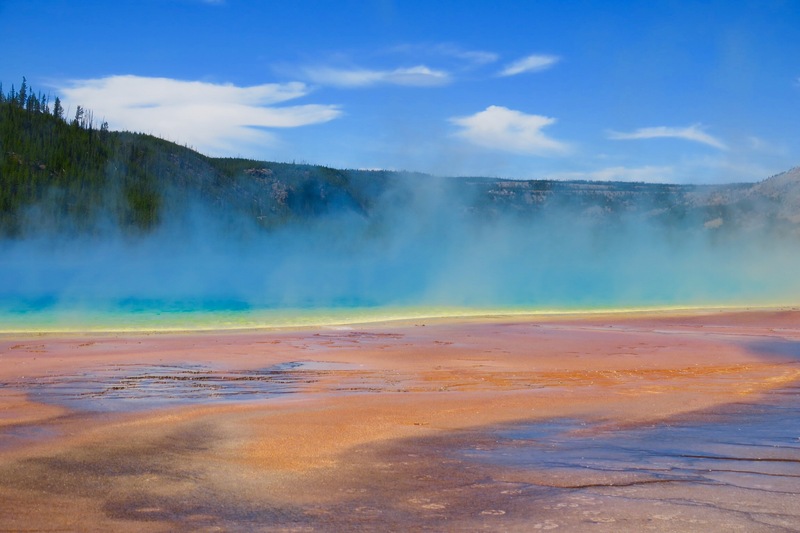 This entry was tagged 100TH ANNIVERSARY, GEOLOGY, GEOTHERMAL, GEYSERS, HOT SPRINGS, MICROBIOLOGY, NATIONAL PARKS, NATURE, PHOTOGRAPHY, THERMOPHILES, TRAVEL, YELLOWSTONE. Bookmark the permalink. 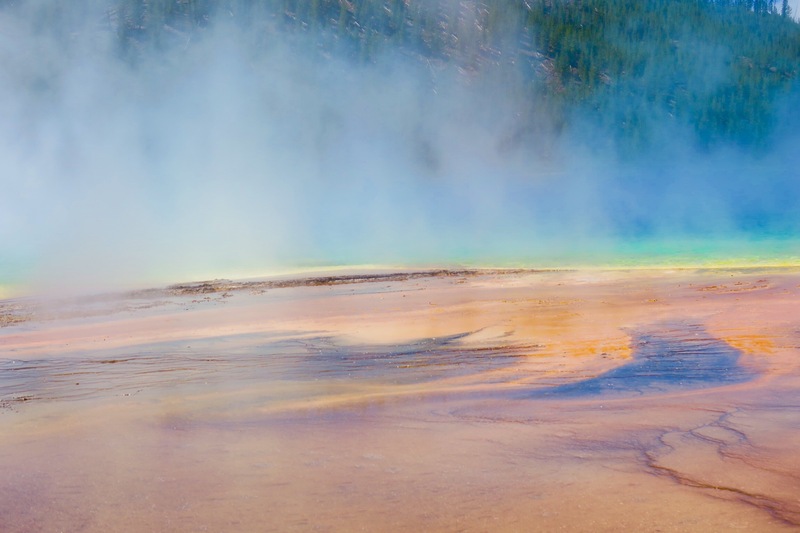 Wonderful pictures, Yellow stone is on my bucket list to visit and your photos have made me want to go even more! Thanks Dom! Throw me some dates!